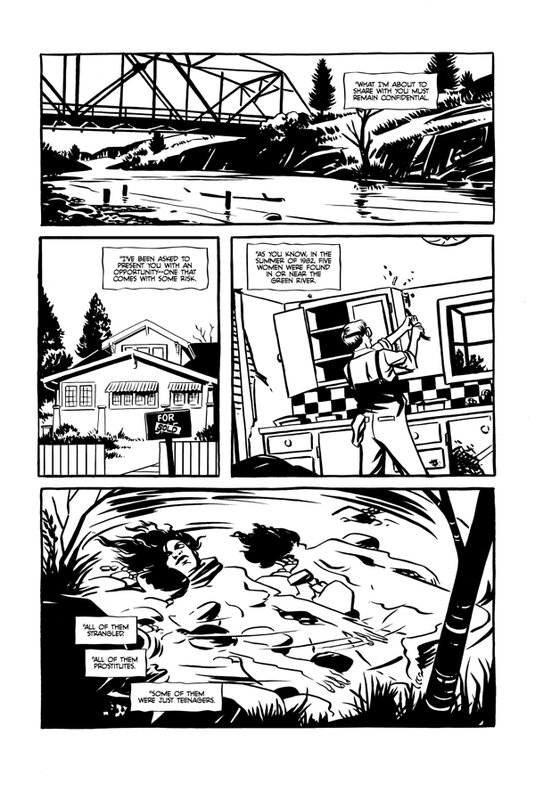 I wrestle with reviewing true-life crime as depicted in comic books. I love reading true crime and watching shows like Forensic Files. But I wonder what possesses me to do so. 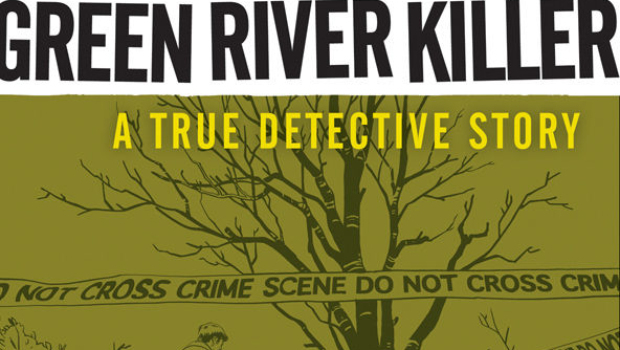 What’s more, should I be watching movies and reading comics based on these murders? After all, this isn’t fiction, these are real people that died as the result of real maniacs. Is it ok to enjoy forms of entertainment based on these crimes? I know that the Scream franchise, at least the first movie, was inspired by Danny Rolling, known of as the Gainesville Ripper here in Florida. I even based a character on Rolling in my Karl Vincent: Vampire Hunter novel Foul Blood. But is any of this ok? Oh, well, on with the review, even as my struggle with doing so continues. 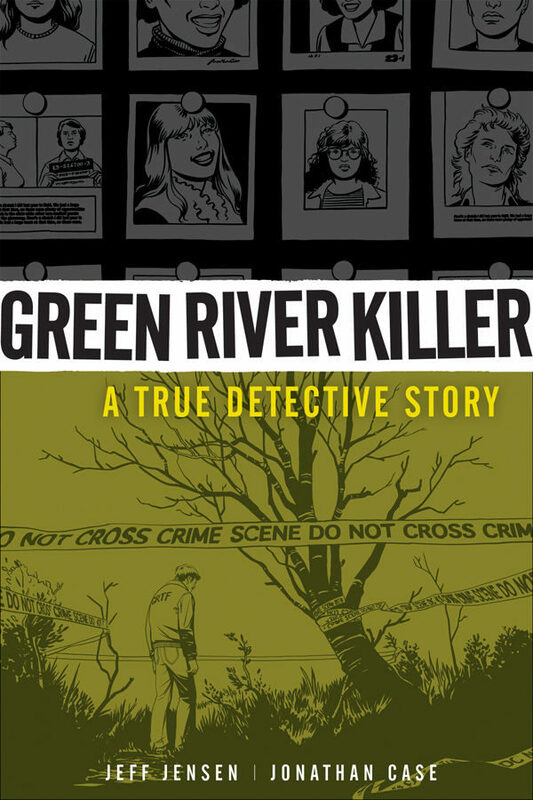 Jeff Jensen knows the story of the Green River Killer quite well. I must confess that, even though I read True Crime novels all the time (Ann Rule is my most read author.) I haven’t read much about this particular case, which is what compelled me to review this issue. Since reading it, though, I’ve done my research and Jensen knows this case. 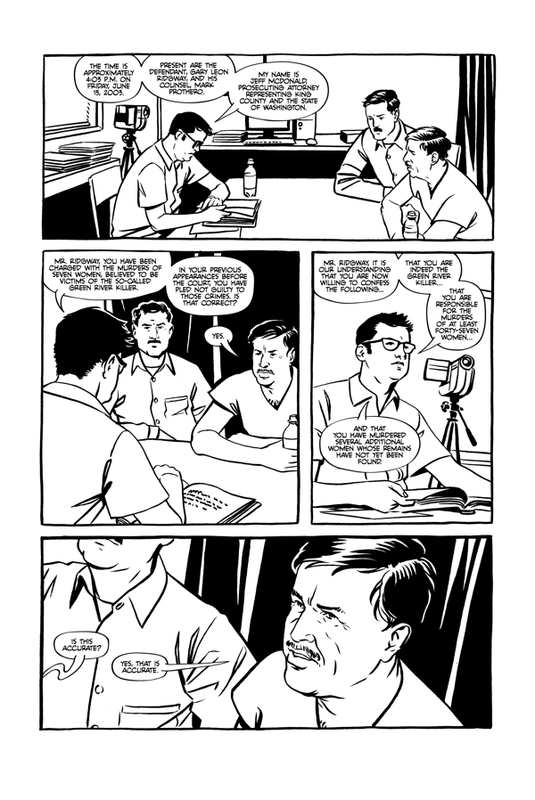 One big problem with comics based on true stories, if they’re not well written, we get a series of narration with pictures. Instead of flowing like a story, it simply reads as the narrator giving us facts accompanied by illustrations, fortunately, Jensen knows how to take the facts and convert it to an actual story and it reads that way. The story is told through the police officer who investigated the case, like the David Fincher film Zodiac and it’s just as compelling. Great stuff includes the issue being so grounded in reality that when the family is shown watching TV, they go to great lengths to get the show they were watching right (Leonard Nimoy’s In Search of… The D.B. Cooper episode.) and showing the police interrogation procedures as they unraveled. Jonathan Case has a simplistic style that works well with this issue. It’s done strictly in black and white, no color at all and this diminishes the “R” rating feel, giving it an almost “PG-13” feel to it, which I find unusual for Dark Horse. This was possibly done because we’re talking about a true crime story and this made it more tasteful than most of their standard horror titles. Highlights include the prolog and the crime scene photos, though realistic, weren’t graphic, being done, again, tastefully.